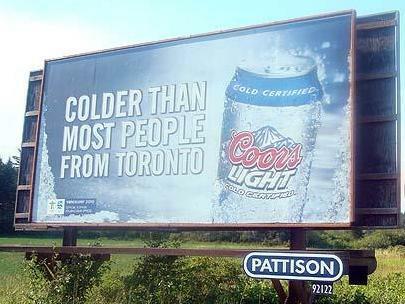 The Toronto Star reported today that multinational brewing corporation Molson-Coors are advertising their Coors Light brand in British Columbia with billboards stating that the beer is “Colder Than Most People From Toronto”. Response to the advertisement was mixed according to the Star, with some finding it humourous, and others finding it insulting. This message was also posted by other Molson reps on Twitter, including Tonia Hammer and Ferg Devins. It’s unclear if there will be a wider announcement of the removal in the form of an official press release or statement. Nice move Coors. What’s next insult New York City then claim bankruptcy? Molson/Coors insults beer drinkers by making bland and tasteless beer. I’m from Toronto, and I don’t see what all the fuss is about. The billboard is witty, it stands out, and it’s a great buy for this campaign. People are too sensitive.